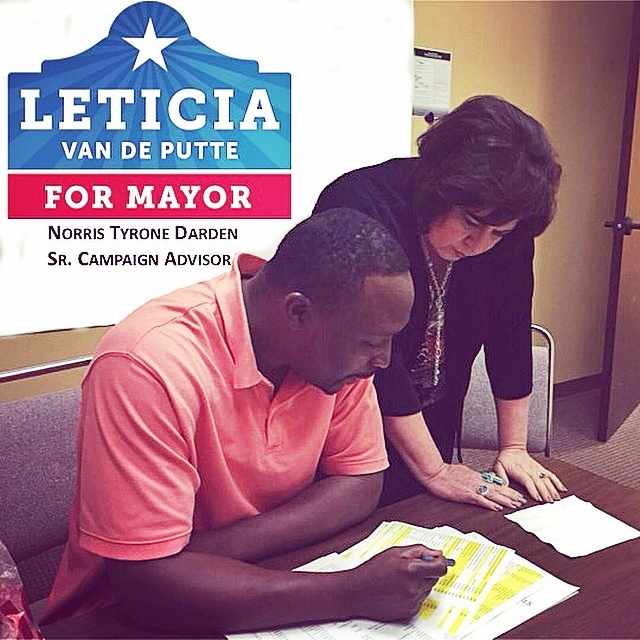 Leticia van de Putte and the LVP for Mayor Staff would like to thank you for your support in this Runoff Election. Your dedication and commitment has been the driving force for our success thus far and it is much appreciated. 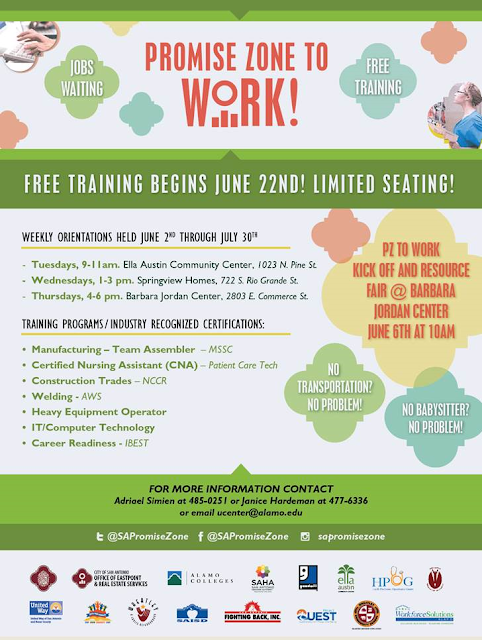 See you soon at this Free event. The Soul Food Bistro, 5814 Rittiman Plaza @ 6:30 p.m. June 1st. San Antonio is the home town of numerous Hispanic leaders and icons whose major contributions have made our city a better place to live as well as the nation over the years. In past columns I have written about a number of them to include familiar names such as union activist for the United International Farm Workers (UIFW) Jaime Martinez. One of his higher profile accomplishments was successfully lobbying city council for over a decade in renaming Durango Boulevard to Cesar Chavez Boulevard after the founder and president of the UIFW. His diligence along with Chavez worked to ensure that union’s basic human rights are not forgotten or abused by the system to earn a decent wage to support their families. Another familiar Hispanic icon I have written about is Mayor Henry Cisneros who set the tone in the early 80s by becoming the first Hispanic Mayor of San Antonio since 1842 and later HUD Secretary under President Bill Clinton. 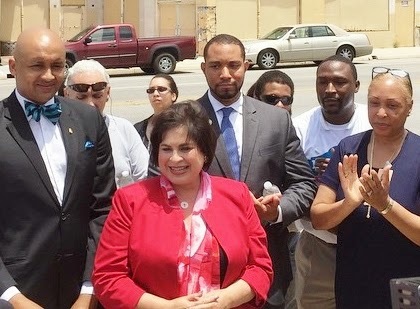 Since he paved the way for other potential Hispanic Mayors, we have since elected Ed Garza, currently serving as SAISD Board President & Julian Castro now Secretary of HUD. 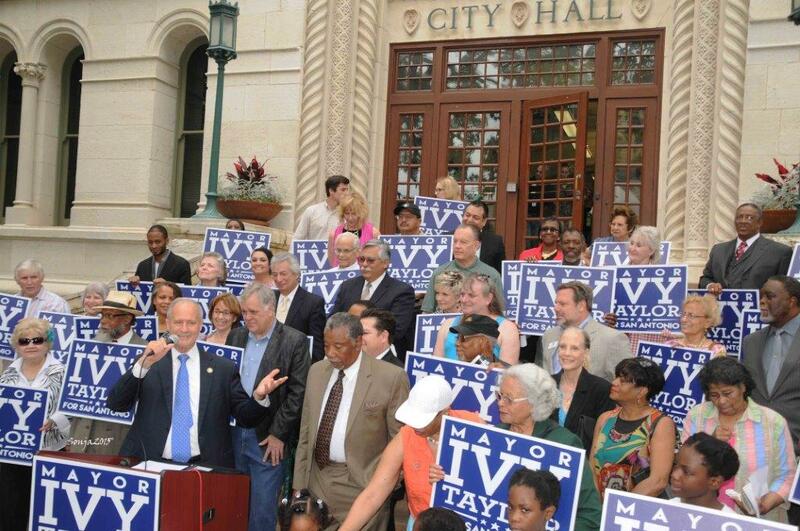 All contribute to the continuing success of the Alamo City. 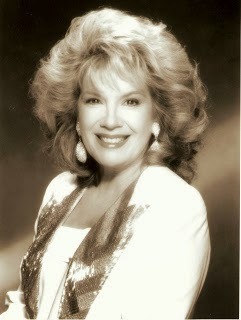 Another local Hispanic icon I have written about in my weekly column includes international singing sensation Patsy Torres, PhD. She is also a motivational speaker encouraging young Hispanic women to follow their dream of success like she did whether it be in music, science, medicine or other fields of their choosing. Here is a short recap of some of those Alamo City icons I wrote about to include a few I have yet to write about in detail. Former Congressman Charlie Gonzalez. I recalled I met the Congressman under less than ideal circumstances. It was the year that his father retired leaving an open seat for Congressional District 20. What I admired about Charlie then and now was his easy going personality, quick wit and charming demeanor. Although he won the race and served admirably for 12 years, he did not lord it over us. He was extremely gracious and we have been friends since. He endorsed me twice in my run for Judge. Former Councilwoman Maria Berriozabal who was also in that race was another I wrote about. 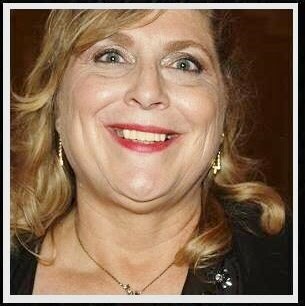 She is one of the classiest women I know, and I know a few. She represented District 1 as a councilwoman for many years and I believe she is far from done in making San Antonio a much better place. I hope I am there when she does it. I will keep my camera handy just in case so I can document it. Then there is long-time activist Rosa Rosales, a well-known champion for immigration reform and Latino issues. She is a Past National LULAC President having served two terms as the organization’s national spokesperson and increasing LULAC as a political force to be reckoned with nationally. A woman who doesn’t mince words, Rosa Rosales has been at the forefront along with the other nationally known icons. Other icons I have mentioned in “Just a Thought” in passing include: Harlandale graduate and actor Jesse Borrego who starred in the movie “Blood in, Blood Out,” and a recurring part in the TV Series, “Fame.” I took photos of a movie he was filming in King William for the Cannes Film Festival. We will see more of him in the future. Last year the San Antonio Association of Hispanic Journalists honored movie film director screenwriter, producer, editor musician Roberto Rodriguez who I mentioned in a column about the SAAHJ gala. You may remember him from the “Spy Kids” movie series. Living in San Antonio amongst so many local Hispanic icons is exciting for me. We have a rich Hispanic heritage in San Antonio that we can be proud of with so many qualified leaders leading us into the future. I am honored that I am able to write about them from personal experience. Environmental Defense Fund is joining several local environmental groups to host an intimate Q&A discussion with San Antonio’s mayoral candidates that will focus on local air quality, water, and sustainability issues. 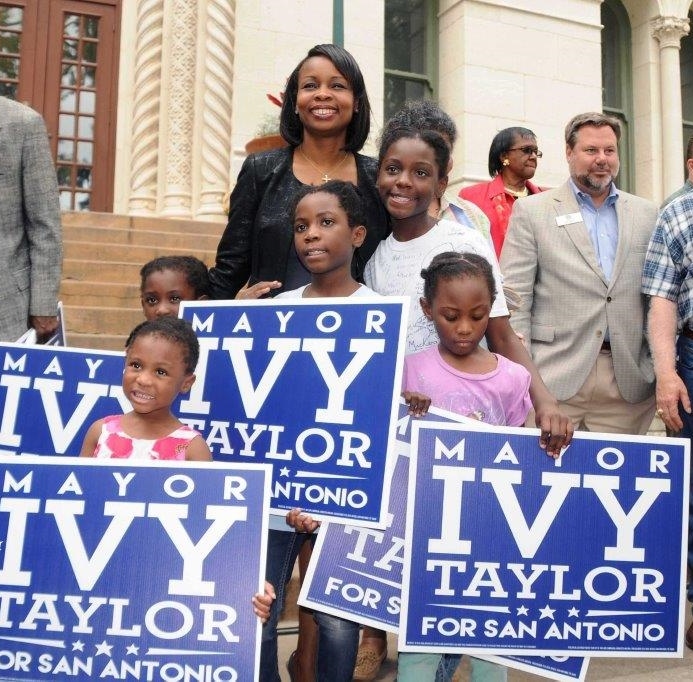 These issues will be a growing area of focus for the next mayor of San Antonio. Water quality and availability, infrastructure, and management continue to be of great concern to San Antonio’s citizens and leaders. And as San Antonio is not expected to meet new Environmental Protection Agency minimum air quality standards for ozone, the winner of this election will be tasked with bringing the city back into compliance with EPA standards. The next mayor will also be the first to implement the City of San Antonio’s sustainability plan. The event’s back-to-back sessions will be moderated by Peter Bella, a leading authority on local air quality and former natural resource director of the Alamo Area Council of Governments. The event also features a short meet-and-greet where audience members will have the opportunity to talk directly to the candidates about these and other issues. 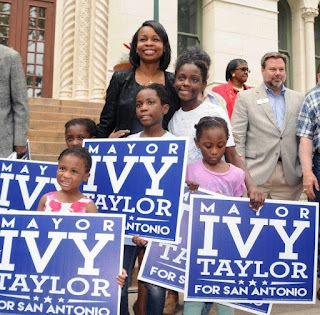 The upcoming Runoff Election for San Antonio Mayor is just around the corner and we will have the chance to make history–to elect a woman to lead our city government. Mayor Lila Cockrell alone has accomplished this feat in our city's history. It is truly a momentous time for San Antonio as we get to choose between two strong, qualified candidates, each who have years of experience, keen understanding of our city, and a boundless passion to make our home an even better place to live, work and raise our families. I am especially proud to live in a city that provides an opportunity for women to grow, work, lead, and serve. The 40 year gap between Mayor Lila Cockrell's first oath of office and this year's upcoming Runoff Election is an indication that we still need to do more to encourage the participation of women in the leadership roles throughout our community, from education to business to public service. Regardless of which candidate you support for mayor, please make a pledge to vote in the Runoff Election so we can make another kind of history – one of record turnout! Early Voting starts on Monday, June 1 and runs until Tuesday, June 9. Election Day is Saturday, June 13. Click HERE for a listing of Early Voting sites. 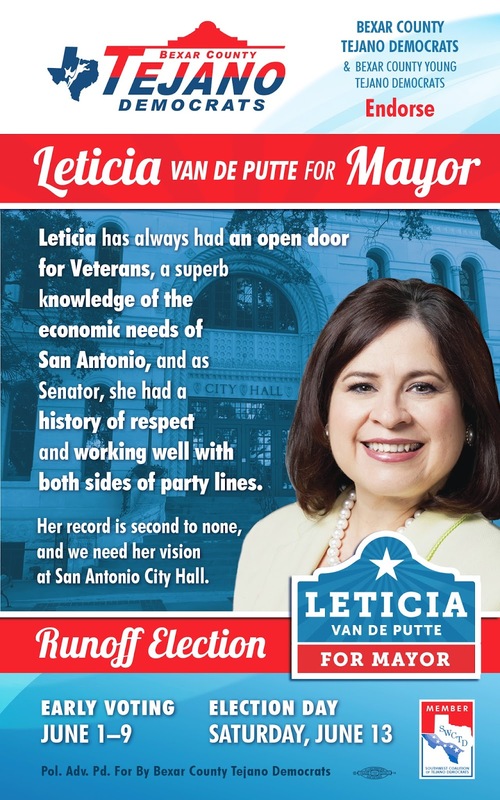 And remember as you step up to the voting machine or mark your mail-in ballot for San Antonio Mayor in this Runoff Election, the names Ivy Taylor and Leticia Van de Putte will be listed and you will experience history in the making. 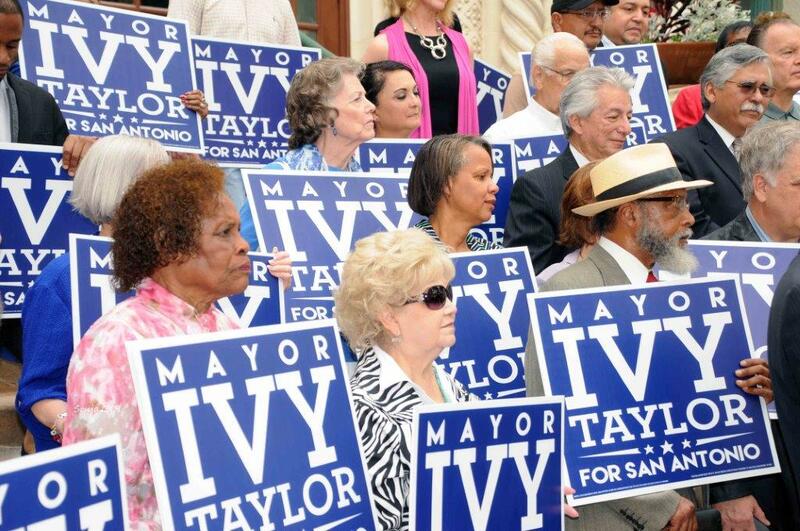 Use the power of your vote to usher in our next Madam Mayor and encourage your friends and family to do the same! tradition will proudly continue as the 14th Annual State of the District will be delivered by Congressman Joaquin Castro representing Texas' 20th District. 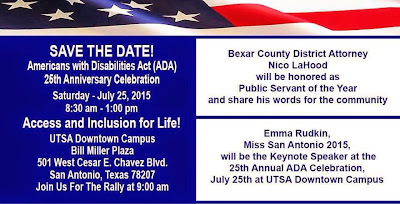 place on Friday, June 19th at the San Antonio Food Bank Event Center. The event starts at 7pm with the State of the District address scheduled to be delivered at 8:15pm. A product of the Western Sector of San Antonio having graduated from Jefferson High School, Castro is quickly making a strong name for himself in our Nation's Capital. 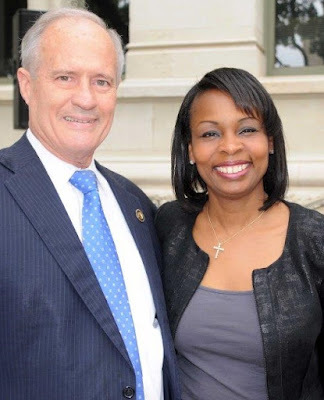 Now in his second term in the U.S. House of Representatives, the Congressman serves on the House Armed Services Committee, as well as the House Foreign Affairs Committee. He was the 2013 co-President for the House freshman Democrats and serves in House Democratic Leadership as Chief Deputy Whip. "We are wonderfully fortunate to have one of the rising political National stars in this Country addressing our membership at one of our benchmark annual events," states West Chamber President Gabe Farias. "Congressman Castro continues to diligently serve his community and our Nation with pride and determination and we are so very proud to call him a friend of the West Chamber." 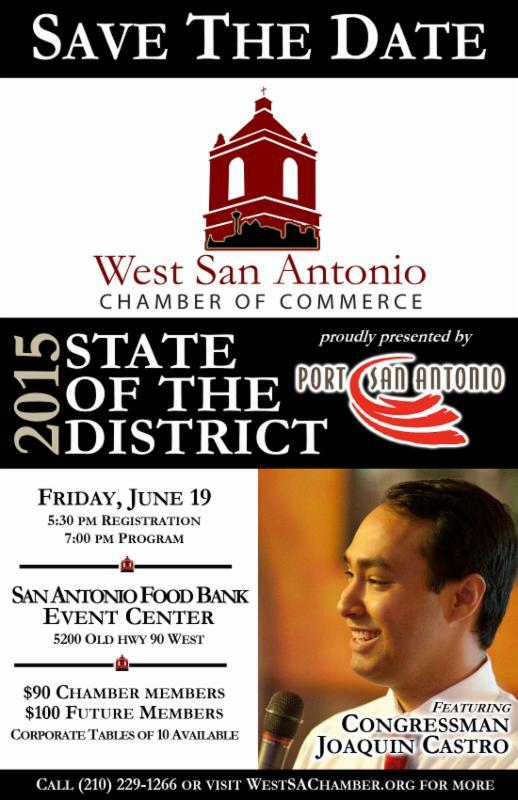 For more on the 2015 State of the District please call (210) 229-1266 or email gfarias@westsachamber.org. Tomorrow we celebrate Memorial Day. As we all know it is a US federal holiday for the men and women who died while serving in the United States Armed Forces and are remembered for their service to our county. For those who are unaware, the holiday, formerly known as Decoration Day, is celebrated every year on the final Monday of May. It originated after the American Civil War commemorated the Union and Confederate soldiers who died in the Civil War. By the 20th century, Memorial Day was extended to honor all Americans who have died while in the military service. Here in San Antonio better known as "Military City" residents go all out to honor our country’s local deceased war heroes, survivors and those who continue to serve in the military all over the world. 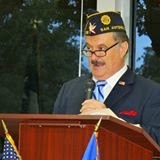 The Edgewood ISD and the Edgewood High School Class of 1967 will co-host one of the largest Memorial Day ceremonies in San Antonio. The 28th Annual Memorial Ceremony begins with a musical prelude at 9:30 a.m. followed by ceremonies at the Edgewood Veteran’s Stadium formerly known as the Frank Mata Stadium. The stadium is located at 1650 W. Thompson Place behind Kennedy High School. The Edgewood Class of 1967 has the dubious distinction of losing more graduates as casualties in the Viet Nam War than any other high school in the San Antonio Metroplex. As a Vietnam Veteran myself that means something to me personally of those that I knew who died there. San Antonio has a long history of patriotic young men and women of all colors and ethnic backgrounds willing to serve the best interests of our nation in a time of war or peace. 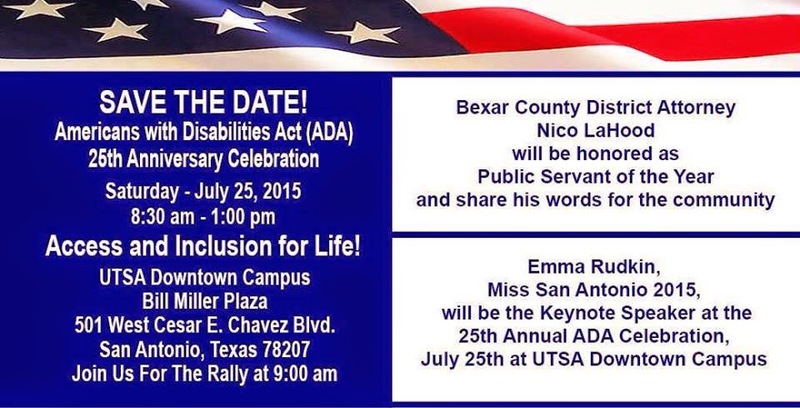 I alternately attend the Edgewood ceremony one year and Fort Sam Houston the next. Fort Sam Houston National Cemetery will simultaneously present their Memorial Day program at the assembly area on the cemetery’s east side. That ceremony hosts Congressmen, VIPs, student choirs, ROTC members, active duty personnel, family members who have lost loved ones to war and many others commemorating our fallen heroes. That service is well attended and open to the public. Historically on Memorial Day, the flag of the United States is raised briskly to the top of the staff and then solemnly lowered to the half-staff position, where it remains only until noon. The flag is then raised to full-staff for the remainder of the day. Never forgetting our fallen heroes we are reminded by the words of the National Anthem. We're writing to you today to share the great news that several media partners, including Time Warner, KENS, KSAT, News 4/FOX San Antonio and Univision are on board as sponsors of the 17th annual SAAHJ Scholarship & Awards Gala on Friday, July 10, at the Marriott Rivercenter. We'll honor Vikki Carr (Corazon de Oro), Michael Quintanilla (lifetime achievement as a journalist) and the lawyers, past and present, of MALDEF (community service). 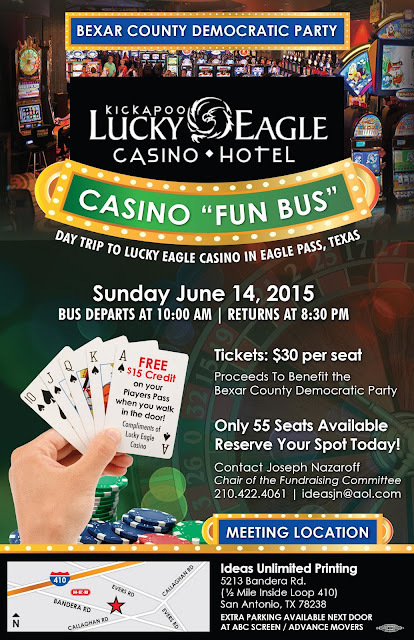 Sponsorships are still available for $7,500, $5,000, $2,500 and $1,500, with eight seats at every table. Individual tickets for members are $100; $125 for non-members. 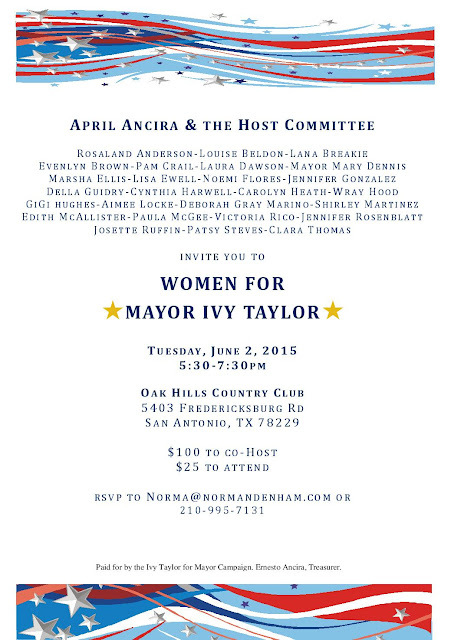 Tickets are available online here, or contact Martha Tijerina, gala tri-chair, who is handling ticket sales. We encourage you to appeal to your station managers and editors to make a decision soon about a sponsorship and/or ticket sales for you and your colleagues. We're six weeks away from our big event, and we need your help getting all the media companies on board. We're attaching information, but if you have questions, call Tessa Benavides at 210-445-3965 or Elaine Ayala at 210-250-3402. I’m proud to have the earned the confidence and support of organizations and institutions from across the community. 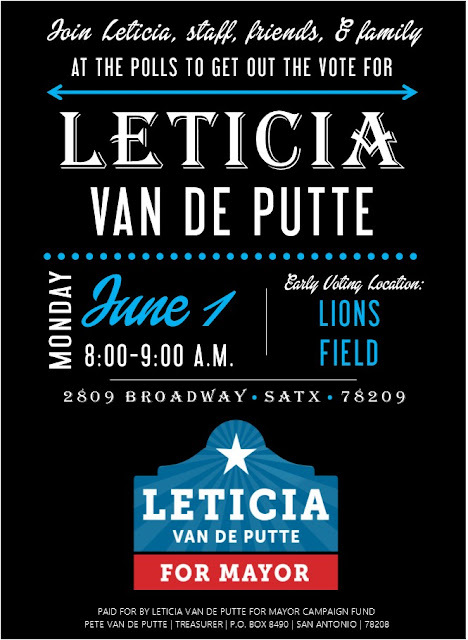 "Senator Leticia Van de Putte has the best combination of political skill and understanding of policy among the contenders. The city is most likely to maintain political stability and continue successfully nurturing its economic development efforts with Van de Putte at the helm." “We need a Mayor who understands public safety and puts families first. Leticia Van de Putte is the only candidate who meets that high standard. We look forward to her leadership on issues from crime prevention to community policing. She has earned our trust with her decades of dedicated public service." We came in first place and the momentum is squarely behind us, but I need your help for the final push in the runoff. The runoff on June 13 is coming up fast, and early voting begins in 8 days on June 1, can you volunteer at our headquarters to block walk, phone bank, and help out? To volunteer visit the the campaign headquarters at 1800 W. Commerce, call 210-228-9007 or signup online, and click the link below to contribute. PAID FOR BY LETICIA VAN DE PUTTE FOR MAYOR CAMPAIGN FUND, PETE VAN DE PUTTE, TREASURER, PO BOX 8490, SAN ANTONIO, TEXAS 78208.